November, 2018 - California Women Lead has released its latest report, California Women in Elected Office 2018 Election Report, followingTuesday's election. Election night 2018 proved, nationally, to be a great year for women. Record numbers of women were elected to serve in Congress, and in California, we elected our first woman to serve as Lieutenant Governor. The turnout of women as contenders in state elections this cycle was promising, but going into the June primary, women were again outnumbered as candidates by at least four-to-one. The June 2018 primary results placed some women in prime positions to win in November, but eliminated many from the final race, further narrowing the number of women candidates, even though we have an increased number of women on the November ballot. The question remains - Was 2018 the next "Year of the Woman?" July, 2017 - This report looks at where women in California stand in terms of serving in elected office at the local, state and federal levels. While women have yet to meet the 50 percent representation in elected office at any level, California Women Lead, in collaboration with the Brown Administration was able to reach 50 percent of women serving in Appointed Office at the state level in 2015. We know women make great public policy leaders, but we need to provide more opportunities, more training and more inspiration for women to consider political engagement if we ever hope to reach the same parity in elected office as we do on California’s appointed boards. November, 2016 - The 2016 General Election produced results less than ideal for women in elected office in California. The number of women in the State Legislature and in California's Congressional Delegation decreased. On a positive note, we did see an increase in the number of women serving on County Boards of Supervisors. Sacramento– California Women Lead and the League of California Cities® Women’s Caucus released a report this morning showing women have increased their representation by 21 total council members since 2014. The update follows last year’s report, “Snapshot on the Status of Women in City Government”, which revealed that the number of California women serving on city councils is not as high as one would suspect, and did not mirror the gains woman made in other parts of the country. 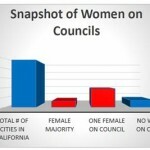 Sacramento– Despite statistical gains made nationally for women in elected office, the number of women in California serving in elected office, particularly on city councils, does not reflect California's female population, according to a report released jointly by California Women Lead and the Women's Caucus of the League of California Cities. The report shows a continued need for increased representation by elected women on city councils across the state. The trend for women’s representation in elected office over the past several election cycles in California has either remained stagnated or decreased. In 2014, the number of women in elected office fell once again. In an effort to dig deeper on the trends pertaining to women in California politics, we are pleased to release our analysis of the County Board of Supervisors and our post-November Election predictions. Unlike the State Legislature where there is a possibility of retaining the current number of seats, women on County Boards of Supervisors will definitely lose seats, the question is only how many. The June 5 Primary results have placed some women in prime positions to win their races in November, but eliminated many from their respective elections, further narrowing the number of women running. Currently, retaining the same number of Senate and Assembly seats is the best-case scenario, and that is not good enough. Slowly, we are realizing the absence of women in leadership positions across the state. You may have noticed in the past few election cycles, the trend for women’s representation in the State Legislature has either remained stagnant or, as was the case in 2012, decreased. We hoped that with state redistricting and an increased number of open seats in newly drawn districts, 2012 would see an influx of women elected to public office. Unfortunately, that was not the case.